Home » All white goods Articles » Washing Machines » Buying Washing Machines » What’s the difference between drum sizes in washing machines? What’s the difference between drum sizes in washing machines? Before looking into different drum capacities, an important point is that you can’t necessarily assume that they are all the same. If you take a dozen washing machines with the same drum capacity you would think you could fit in exactly the same amount of laundry in them all. However, this isn’t necessarily the case. One manufacturer’s 7Kg drum may have a smaller or larger capacity than another’s. My understanding is that they don’t all use the exact same criteria for deciding drum sizes in washing machines. The design of the drum paddles and the door glass can also impact how much laundry can fit inside. Manufacturers can employ professional packers and use specific items of laundry in order to physically fit as much laundry in as possible, but in a way that no ordinary user would. 6Kg drum capacity is now the smallest size drum capacity, but still quite large compared to historic drum sizes, which were 4 to 5 Kg for decades. 6 Kg may already be seen as too small for many people but it probably represents the optimum drum size. That is, it’s neither too big nor too small, and fewer (if any) compromises have to be made to accommodate it. Unless you have regular extra large loads of washing to do or specific large items that need washing occasionally it should be fine. My first experience of a 7 kg drum capacity was with the now obsolete Dyson washing machine. The way that this drum was designed is very unique, and coupled with the fact that it had a very shallow door glass and quite small drum paddles I can safely say that you could not fit as much laundry inside a normal 7 kg drum as I could in this one. When I later tested a “normal” 7Kg drum from another manufacturer it just wasn’t as big – even though they are both sold as 7Kg capacities, which confirms my opening paragraph. I would think you would probably need at least an 8 kg drum to be on a par with the Dyson CR01 7Kg drum. The photos below compare the 7 kg drum with a standard 5 kg drum. 5 kg drum capacities are what we all used for decades and have now been replaced by 6 kg drum as the new standard. So arguably this section is of limited use because it compares drum size that is actually larger than all other 7 kg drums as explained above with a drum size no longer available. However, there will be plenty of people still using old 5 kg drums, and it is an interesting look at how drum capacities have increased. The photos below show the results of trying to fit a duvet into an old 5Kg drum washing machine, which was pretty futile. 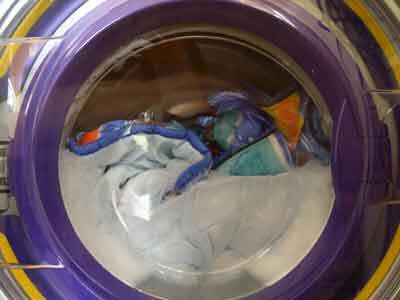 The photo at the side of it shows the same duvet happily being washed inside the Dyson CR01 washing machine’s 7Kg drum. Remember that as described above, this Dyson drum was unique and despite being sold as 7Kg capacity it could definitely fit more laundry inside than any other 7Kg capacity drum I’ve seen since. I reviewed a Samsung 8 kg drum capacity washing machine a few years back. 8 kg is pretty big. 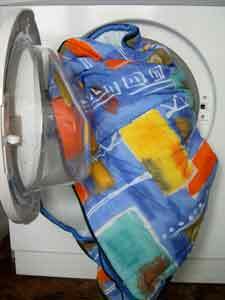 If you have a lot of washing and are able to wash very big loads it might be more economical to use such a large drum. However, don’t forget to check out my previous article for the pros and cons (washing machine drum sizes – pros & cons). Check out my photos below for an idea of how much laundry you might fit into an 8 kg drum. 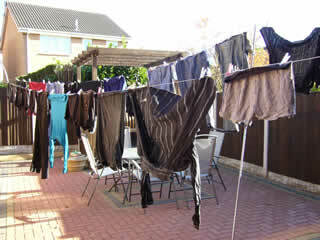 This photo shows a pile of laundry waiting to be hung out to dry after being washed in the 8kg drum whilst testing it. I can’t say whether or not this load represents the maximum that can be washed as I wasn’t concentrating on that aspect. However, I did fill the drum up reasonably well and managed to get quite a lot of laundry inside. It is safe to say we have never had such a large load in the laundry basket, and clearly these baskets were designed at a time when washing machine drums were considerably smaller. The 8Kg drum capacity allows a lot of washing to be done in one load. 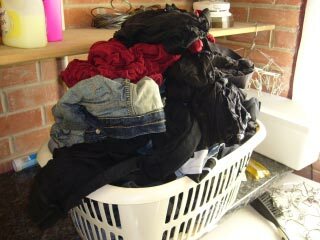 This picture shows just one wash load of laundry and looks more like two loads. In the middle of the second line at the back of the picture is a rotary sock hanger with 32 socks hung up too, but it’s obscured on this photo.